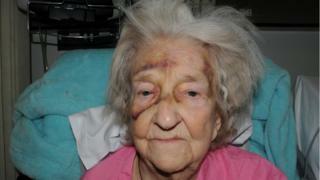 Image caption Eileen Blane told police: "He just wouldn't stop hitting me"
Someone in the community is protecting a man who murdered an 87-year-old woman by beating her during a burglary, Greater Manchester Police said. Detectives investigating the attack on Eileen Blane, in February 2017, are urging those who know her killer's identity to "do the right thing". Mrs Blane was thrown to the floor and had her wedding ring taken from her finger during the raid in Stretford. A £50,000 reward remains on offer for information leading to a conviction. Det Insp Ben Cottam said: "The cruelty and brutality involved was quite staggering. It's hard to imagine what kind of person would do this to another human being." He said there are people who know who did this, appealing to them directly: "Do the right thing and give us the name. "Imagine if this happened to one of your loved ones. You'd be heartbroken, angry and determined that the killer is brought to justice." Mrs Blane's son, John Blane, previously told the BBC's Crimewatch Roadshow how his mother had answered a knock at the back door, thinking it was the window cleaner. The suspect pushed into the house and punched Mrs Blane in the face. During an interview, she told police: "He just wouldn't stop hitting me. I just asked him to stop but he wouldn't. He said he wanted gold. It was just a nightmare." While the attacker searched upstairs, Mrs Blane managed to escape to her neighbours, who called the police. She spent eight weeks in hospital with three cracked ribs, a fractured vertebra and severe bruising. She died the day after she was discharged, on 1 April 2017. Police said her attacker is white, slim, aged in his 20s and about 5ft 8ins. He was wearing a dark jacket with the hood covering his face. A 29-year-old man arrested on suspicion of murder in 2018 was released without charge.